Last part of the series looking at the Badab War chapters, characters and army lists. This article focusses on the traitor Chapters and the Tyrants legion army list. Masters of rapid assault and encirclement, the Astral Claws prideful fall from grace ultimately led them to become the Red Corsairs. 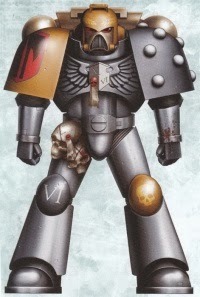 One of their 4 special rules states that they should be represented as Red Corsairs in the post-Badab era, while another states that in the Tyrants legion army list (see below) Chapter tactics: Astral claws should be used to represent SM units. Speaking of which, reckless courage grants stubborn and prevents Astral Claws from voluntarily falling back. Rapid assault and encirclement grants skilled rider to bikes and scout to fast skimmers. An interesting combo of tooled-up fast attack units and solid core troops, the chapter tactics are okay but nothing amazing. We'll look at how they fit in with the Tyrants Legion army list later. Chapter Master Lugft Huron - Chapter master stats with a host of wargear and rules for 235 points. 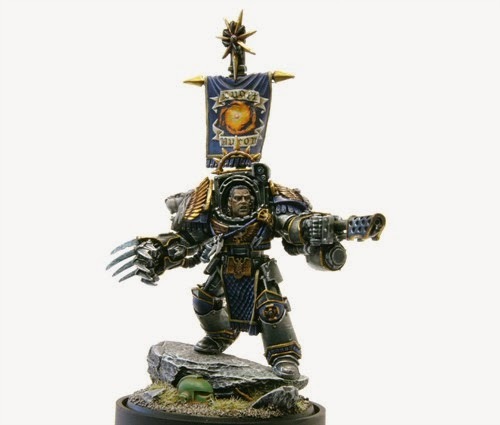 His wargear is terminator armour, an iron halo, heavy flamer and the razors, which are effectively an AP2 lightning claw against which invulnerable saves must be rerolled - nasty! His Warlord trait, master of counter assault, means any units entering from reserve gain counter attack til their next turn. When he is removed from play for the first time, on a 2+ he gets up and carries on with one wound. 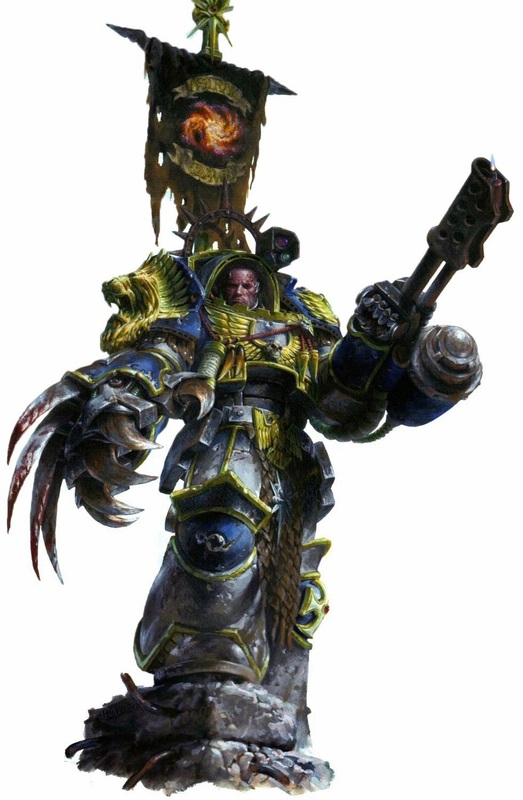 Also, all friendly space marine and Tyrants legion units may use his Ld while he is on the table. Lastly, he gets big guns never tire, which is effectively a better orbital bombardment as it is S10AP1 barrage 5" ordnance 2. Overall I think Huron is a beast, scoring highly in all departments. In melee he can take on most things, he is very survivable and also boasts a nasty one use shooting attack. A good choice for HQ. Captain Corien Sumatris - Captain stats except only BS4 but WS7. He has a storm shield, digital weapons, a spectre pattern bolter and goldenfang. The spectre pattern is a 12" assault 2 bolt weapon, while goldenfang is a master crafted power sword granting rage. He also has furious charge, the tyrants champion (his squad also get furious charge and units in 12" get +1WS) and his Warlord trait adds 1 victory point per character slain. A reasonable choice for 165 points given his wargear and rules. 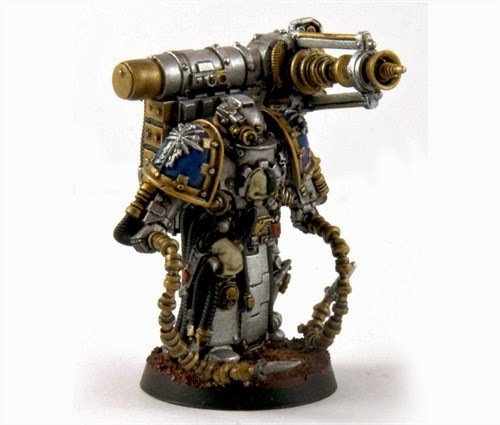 Armennus Valthex - for 145 points you get a master of the forge with the usual special rules and artificer armour. In addtion, you get a conversion beamer and the indynabula array, which grants a 5++, counter attack and an AP3 melee specialist weapon. In addition, a single squad may upgrade their bolt weapons to hellfire rounds (including storm bolters) for free! Lastly, any dreadnoughts within 6" of valthex can be denial units. Not a bad choice at all to be honest as the conversion beamer alone makes him dangerous. His warlord trait seems semi-redundant if you want to use him in the back-field for shooting though. I can see his hellfire upgrade being useful on Terminators. Arch-Centurion Carnak Commodus - For 105 points you get more or less chaplain stats with Ld9, A3 and I5. He packs an Iron halo, Void hardened armour and bloodbiter, which is a S+1 AP5 rending melee weapon. In a Tyrants legion list (see later) a single retaliator squad may be troops if Commodus is HQ. Also, his Warlord trait, cut them down, allows him and his unit to re-roll sweeping advance rolls. A fairly mediocre choice for the points but maybe worth considering in lower points games. 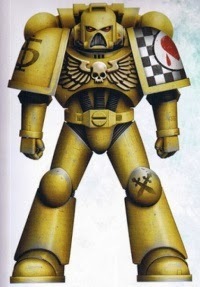 The Lamenters are Blood Angel successors, less marred by the black rage and red thirst but also very unlucky and prone to disaster. They use BA chapter tactics. Malakim Phoros - although he is master of the Lamenters he only has 3 wounds despite the 175 point price tag. He has an inferno pistol, glaive encarmine, the red thirst, an iron halo and artificer armour as you would expect from a son of Sanguinius. His Glaive is +1S in a turn he charges. He has the zealot rule and rage unto death, which add +1S and +1A to his profile once he has lost a wound. In addition, he will gain rage as will any squad he joins. His Lord of ruin Warlord trait grants any unit within 6" hatred. So basically he's a beast in combat best leading squads from the front and is effective against all but 2+ save armour. Grouping lots of friendly units near him will enhance their performance as will putting him with a decent assault unit once he's wounded. These chaps are experts in stealth and rapid strikes. Despite being Whitescar successors they boast their own set of chapter tactics. Shadow killers grants all (non bulky) infantry both move through cover and hammer of wrath. In addition, when striking from non-purchases cover they gain furious charge. Children of prophecy grants two rules. Firstly they may reroll to seize the initiative. Second, Librarians may choose from divination rather than the usual SM psychic power choices. An interesting rule set that lends itself to tactical play and could be fun to use. Non-jump assault infantry would seem to benefit from the rules as would CCW/BP scouts. Ahazra Redth - The Chief Librarian of the Mantis Warriors is Librarian stats with W3 and I5. He is mastery 2, has a force sword and comes in at 165 points. His Talisman of sundered souls allows him to re-roll his first failed psychic test and also grants a 5++. As well as being able to choose one power from biomancy, telepathy, divination and pyromancy, he also comes with the mirage psychic power, which is a blessing granting the unit shrouded and meaning anyone assaulting them must make a disordered charge. Lastly, his warlord trait grants interceptor and night vision to his unit. Not quite as powerful as comparably priced psykers such as Tigurius and Loth, though the 5++ is a definite perk and Mirage should be very useful. Imperial Fists by bloodline but far from it in action, the Exectutioners are savage and barbaric. They ignore negative Ld modifiers and all characters gain headhunters, meaning all rolls to hit of 6 will inflict instant death should they wound. Also, the highest WS model in a combat must always issue a challenge. The negative Ld modifier doesn't benefit the army that much but the headhunters rule could be decisive when characters are engaged against MCs or Warlords. High Chaplain Thulsa Kane - for 190 points you get a captain stat line with zealot, a plasma pistol and rosarius. Lifetaker is a S6 AP2 unwieldy 2-handed melee weapon. Ghrendalins bones is artificer armour granting Kane eternal warrior. The Aenigmata Ferrum means any space marine within 12" of Kane can re-roll 1s to wound when charging. Lastly, his warlord trait means that any Executioners can add +1 to sweeping advances and combat resolution in a turn Kane is in a challenge. He's quite expensive but at the same time rather pimped out and decent when at the centre of a large combat as he bolsters those around him. Worth taking in an assault heavy army (don't forget rolls of 6 to wound with his weapon will grant instant death thanks to Executioner chapter tactics). The list uses the special rules / chapter tactics covered in the Astral claws section above. Void hardended armour - reroll saves Vs blasts and templates, 1" less for run, charge, sweeping. Breacher charge - single attack in assault phase - S8AP2 blast that gets placed in base-to-base with equipped model. If you miss in combat roll a scatter dice and move it there. The wrecker rule means you reroll penetration and add +1 to the damage table vs buildings. The list combines elements of both Astartes and human Auxillia which should be obvious from the entries covered in a bit. This is pretty important as they are not your typical SM entries and thus it very much nicely represents a typical type of army you may expect to see in the 40K Universe, effectively a human army led by a few Elite Space Marines. Of course you can always represent this using GW/FW books and the allies matrix, but this allows them to merge more seamlessly, share transports etc. It is also a good way of making a Lost and Damned army list on the cusp of falling to Chaos, which is pretty much where the Astral claws were at. 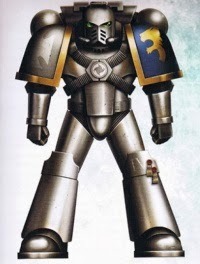 Also, the Astartes HQ characters have the Angel of death rule which means that any Auxilia they lead do not benefit from ATSKNF but at the same time they will not run away with the Auxilia. 1-2 - warlord causes fear and auxilia units in 12" that fail a check can reroll but take D3 wounds. - Centurion - A Centurion must be taken as a compulsory choice in games of 1500 or above. He's basically a veteran marine with 2 wounds and has access to melee, pistol and combi weapons. - Auxilia command squad - basically an Imperial Guard command squad with the option to upgrade the HQ model from a 2 to 3 wound version and also take options such as combat shields. They have a rule allowing all human Auxilia in 18" to use their leadership. - Corpse taker - an apothecary with 2-9 servitors that can take power weapons. Any enemy or friendly space marine (i.e. have ATSKNF) units wiped out within 6" will grant an extra victory point on a roll of 6. - Marauders - basically veterans humans with WS4 and 2A and a 2-wound sergeant. They have the option to take up to 2 3-wound brutes, with S/T4 but lower BS (they are bulky and rend). There are special weapon options and the leader has pistol, melee and ++ save options. They may never regroup and can choose from 3 veteran options - outflank, stealth and move through cover; furious charge and crusader; carapace armour and krak grenades. - Retaliators - veteran space marines with combat shields and void hardened armour - effectively a close combat squad that can take a special weapon and has pistol/melee options for the sergeant. - Trojan - can grant a single vehicle within 6" preferred enemy. Transports 6 models. - Lighter - a flyer that can transport 12 models and can take a variety or weapons, but all of them may only fire snap shots all the time. - Legion space marines - pretty much the same as a normal squad except for every 5 models (20 max) you may equip a variety of special, heavy and melee weapons. - Auxilia armsmen - more like a normal imperial guard squad that can re-roll 1's to hit while shooting but not charge that turn if they remain stationary. - Legion sentry guns - taratulas. - Maelstrom Naval detachment - one choice from either a Lightning, Thunderbolt or Avenger. There is also a section at the end covering lords of war, which includes Thunderhawks, a Typhon and pretty much all the Imperial Guard Lords of war. That concludes my look at the Badab war books. I must admit they are interesting and also confusing at times (the Tyrants legion list takes some getting used to) but more Chapter and character options is always a good thing for the game IMO and I'm glad I'm now more familiar with them all.